For other people named István Szabó, see István Szabó (disambiguation). The native form of this personal name is Szabó István. This article uses the Western name order. Born in Budapest, Szabó is the son of Mária (née Vita) and István Szabó, the latter of whom was a doctor from a long line of doctors. Szabó came from a family of Jews who had converted to Catholicism, but were considered Jews by the Arrow Cross Party (Hungarian Nazis). They were forced to separate and hide in Budapest sometime between October 1944, when Nazi Germany occupied Hungary and installed the Arrow Cross in power, and February 1945, when the Soviets defeated the German Army in Budapest. Szabó survived by hiding at an orphanage, but his father died of diphtheria shortly after the German defeat. Memories of these events would later appear in several of his films. In 2006 the Hungarian newspaper Life and Literature revealed that Szabó had been an informant of the Communist regime’s secret police. Between 1957 and 1961, he submitted forty-eight reports on seventy-two people, mostly classmates and teachers at the Academy of Theatrical and Cinematic Arts. According to historian Istvan Deak, only in one case did Szabó's informing cause significant damage, when an individual was denied a passport. After the article was published, over one hundred prominent intellectuals, including some of the people Szabó had denounced, published a letter of support for him. Szabó’s initial response to the article was that informing had been an act of bravery intended to save the life of former classmate Pál Gábor. When this claim turned out not to be true, Szabó admitted that his true motive had been to prevent his own expulsion from the Academy. As a child, Szabó wanted to be a doctor like his father. By the age of 16, however, he had been inspired by a book by Hungarian film theorist Béla Balázs to become a film director. Upon graduation from high school, he became one of 11 applicants out of 800 who were admitted to the Academy of Theatrical and Cinematic Arts. At the Academy, he studied with the famous director Félix Máriássy, who became something of a father figure to Szabó. Among his classmates were Judit Elek, Zsolt Kézdi-Kovács, Janos Rozsa, Pál Gábor, Imre Gyöngyössy, Ferenc Kardos, and Zoltán Huszárik. While at the Academy, Szabó directed several short films, culminating in his thesis film, Koncert (1963), which won a prize at the International Short Film Festival Oberhausen. Thanks to János Herskó, head of the Hunnia Film Studio at which he apprenticed, Szabó was given his first opportunity to direct a feature film at the age of 25, rather than being required to spend ten years working as an assistant director. The beginning of Szabó’s career coincided with the beginning of a “new wave” in Hungarian cinema, one of several new wave cinemas that occurred around this time throughout Western and Eastern Europe. The Eastern European new waves were caused by political liberalization, the decentralization of film industries, and the emergence of films as valuable commodities for export to Western European markets. The resulting films were more formally experimental, politically anti-establishment, and, especially in the case of Szabó, psychologically probing than the films of the previous generation. Hungarian filmmakers in particular experienced a significant increase in freedom of expression due to the reforms of the Kádár government. Szabó's first feature film, The Age of Illusions (1964), is a partly autobiographical film about the struggles of Szabó’s generation in starting a career, encountering the obsolescence of the older generation, and establishing romantic relationships. The appearance of a poster for François Truffaut's The 400 Blows in the background of a scene suggested Szabó's artistic compatibility with Truffaut and the French New Wave. The film won the Silver Sail for Best First Work at the Locarno International Film Festival and a Special Jury Prize for Best Director at the Hungarian Film Festival. Father (1966) is a coming of age story that displays Szabó’s increasing fascination with history and memory. The main character copes with the childhood loss of his father against the backdrop of the Hungarian Revolution of 1956 and memories of the Arrow Cross dictatorship. The film won the Grand Prix at the 5th Moscow International Film Festival and the Special Jury Prize at Locarno, and established Szabó as the most internationally famous Hungarian filmmaker of his time, as well as an auteur in the European film tradition. 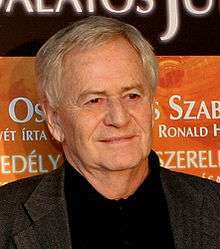 In 2000, Father appeared as number 11 on a list of the 12 best Hungarian films according to a group of Hungarian film critics. Lovefilm (1970) focuses on a young man’s relationship with his childhood sweetheart, told through flashbacks that include the Arrow Cross dictatorship and 1956, and rendered in an experimental, fragmented form. This experimental tendency in Szabó’s films reached its apotheosis in 25 Fireman Street (1973), which began as a short film, Dream About a House (1971). 25 Fireman Street takes place during the course of a long, hot night in Budapest, during which the residents of a single apartment building are plagued by dream-memories of pain and loss spanning thirty years, including both World Wars, the Arrow Cross dictatorship, the Communist takeover, and 1956. While the film won the top prize at Locarno, Szabó was upset by its lack of success at the box office and at film festivals. Attributing this lack of success to the film's complex structure, he decided to give his next film a simpler structure. In Budapest Tales (1976), Szabó traded his earlier, complex narrative structures, characterized by flashbacks and dreams, for a more linear one. At the same time, he traded the literal representation of history for an allegorical one. The film follows a disparate group of people who come together on the outskirts of an unnamed city at the end of an unnamed war to repair a damaged tram and ride it into the city. Allegorically, the film was interpreted by critics variously as representing Hungarian history specifically or universal human responses to war and reconstruction more generally. Szabó's first four full-length films featured the actor András Bálint in roles based on Szabó himself. While Bálint also appeared in Budapest Tales, this was Szabó's first feature film that did not contain a significant amount of autobiographical material. He did not make another autobiographical film until Meeting Venus, eighteen years later. Budapest Tales was even less successful than 25 Fireman Street at the box office and festivals. According to author David Paul, this may explain why Szabó shifted gears even more dramatically in his next film, Confidence (1980), in which historical events are represented straightforwardly, and are filtered through neither memory nor allegory. The film focuses on the relationship between a man and woman who are forced to share a room as they hide from the Arrow Cross toward the end of the Second World War. It garnered a Best Director award for Szabó at the Berlin Film Festival and was nominated for the Academy Award for Best Foreign Language Film at the 53rd Academy Awards. Szabó’s next three films constituted a new phase in his career—moving away from Hungarian productions, in Hungarian, written by Szabó alone, and featuring Bálint, and moving toward international co-productions, in German, written by Szabó in collaboration with others, and featuring Austrian actor Klaus Maria Brandauer. The informal trilogy—Mephisto (1981), Colonel Redl (1985) and Hanussen (1988)—features Brandauer in a series of roles based on historical figures who, as represented in the films, compromised their morals in order to climb the ladder of success within a context of authoritarian political power. In Mephisto, based on a novel by Klaus Mann, Brandauer plays an actor and theater director in Nazi Germany, a role based on Mann’s former brother-in-law Gustaf Gründgens. The film won the Academy Award for Best Foreign Language Film, and the award for Best Screenplay at the Cannes Film Festival, and greatly increased Szabó’s international prestige. In Colonel Redl, Brandauer plays Alfred Redl, counter-intelligence chief of the Austro-Hungarian Empire who was blackmailed into espionage for the Russians in order to prevent the revelation of his homosexuality. The film won top awards in Germany and the UK, but provoked a scandal in Austria, where several periodicals accused the film of bringing the country into disrepute. In Hanussen, Brandauer plays the real life clairvoyant performer Erik Jan Hanussen, whose growing fame brings him into increasingly close—and dangerous—contact with the Nazis. After his Brandauer trilogy, Szabó continued to make international co-productions, filming in a variety of languages and European locations. He has continued to make some films in Hungarian, however, and even in his international co-productions, he often films in Hungary and uses Hungarian talent. Meeting Venus (1991), the first of several English-language films directed by Szabó—and his first comedy—is based on his experience directing Tannhäuser at the Paris Opera in 1984. Niels Arestrup plays a Hungarian directing the opera at an imaginary pan-European opera company, and encountering a multitude of pitfalls that symbolize the challenges of a united Europe. An inside joke was that the multinational characters were all named with translations of "Taylor", which is the meaning of "Szabó". With Sweet Emma, Dear Böbe (1992), Szabó returned to a strictly Hungarian subject—this time, however, focused on a contemporary, rather than historical, social problem. The film follows two young, female teachers of Russian facing the obsolescence of their specialty after the fall of the socialist government, as well as a variety of types of sexual harassment in the new Hungary. The film won the top prize at the Berlin Film Festival. Sunshine (1999)—a three-hour historical epic, and an English-language, international co-production—was viewed by many critics as Szabó’s most ambitious film, and, along with Mephisto, his most important. Hungary’s Jews had figured in either a marginal or coded fashion in several of Szabó’s earlier films, produced during the socialist period when discourse around the history of the country’s Jews was more circumscribed. In Sunshine, for the first time, Szabó focused explicitly on this aspect of Hungarian history, which he himself had experienced as a child during the Arrow Cross dictatorship. Ralph Fiennes plays three generations in the Sonnenschein family as they experience the trials of twentieth-century Hungarian Jewish history, from the late Austro-Hungarian Empire through the Holocaust to the 1956 Revolution. Several characters are based on real people, including the Zwack family, with their successful liquor business, the Olympic fencer Attila Petschauer, and the Jewish police official Ernö Szücs. The film won European Film Awards for Best Screenwriter, Best Actor, and Best Cinematographer. It received a rating of 74% Fresh from review aggregator Rotten Tomatoes. In Taking Sides (2001), Szabó returned to thematic territory he had explored in Mephisto. Stellan Skarsgård plays real life German conductor Wilhelm Furtwängler, and Harvey Keitel a U.S. Army investigator interrogating Furtwängler about his collaboration with the Nazis. The film won several awards at the Mar del Plata Film Festival in Argentina, including Best Director. Being Julia (2004), based on a novel by W. Somerset Maugham, stars Annette Bening as a famous British actress experiencing a series of romantic and professional rivalries. Bening won a Golden Globe Award for her performance. In 2005, Szabó was awarded the Lifetime Achievement Award at the 27th Moscow International Film Festival. Rokonok (2006) was a Hungarian production based on a 1932 novel by Zsigmond Móricz about political corruption. Sándor Csányi plays a newly elected attorney general whose relatives (rokonok) come out of the woodwork looking for favors. It was entered into the 28th Moscow International Film Festival. The Door (2012), an English language production based on a Hungarian novel by Magda Szabó (no relation), focuses on the relationship between an affluent novelist (Martina Gedeck) and her poor, mysterious maid (Helen Mirren). It opened the 13th Tbilisi International Film Festival, and won the Michael Curtiz Audience Award at the Hungarian Film Festival of Los Angeles. Szabó’s frequent collaborators have included actors András Bálint, Klaus Maria Brandauer, Péter Andorai, and Ildikó Bánsági; cinematographer Lajos Koltai; and screenwriters Péter Dobai and Andrea Vészits. Several interconnected themes run through Szabó’s films, the most common being the relationship between the personal and the political or historical. On the personal level, his first three feature films deal with coming of age issues, but political/historical events form the backdrop of these issues and continually rupture the attempts of the characters to lead their private lives. In an interview in 2008, Szabó said, “My mother once told me, ‘We had a nice childhood and our youth was beautiful, but our life was destroyed by politics and history.’” The political/historical events most commonly depicted are the dominant traumatic events of mid-20th century Hungarian and Central European history—Nazism, the Second World War, and, in Hungary—or, more accurately, Budapest—the Arrow Cross dictatorship and the Holocaust, the Communist takeover, and the 1956 Revolution. Szabó himself has frequently referred to this theme as the search for security. A related theme is the moral compromises individuals make in order to succeed in immoral political systems. In an interview about Taking Sides, Szabó said, “I don't think that life is possible without making compromises. The question is only one of limits: how far to go. When one crosses the line, then the compromise starts to be a bad, even deadly, one.” This theme is dominant in the Brandauer trilogy and, as Istvan Deak points out, may be related to Szabó’s own collaboration with the Communist secret police. Another closely related theme is the arts—most often theater, but also music and film itself. In several of Szabó’s films—most famously in Mephisto—artists become caught up in conflicts around politics, role-playing, and identity. Szabó’s early films—culminating in Lovefilm and 25 Fireman Street—were influenced by the French New Wave in their experimentation with flashbacks, dream sequences, and unconventional narrative structures built on these techniques. Szabó emphasizes iconography in his films, insofar as he tends to invest certain objects and places with symbolic meaning. Tram cars play this role in many of his films, and one becomes the central image in Budapest Tales. Budapest itself plays an important role in many of his films, including scenes of the Danube and of buildings Szabó lived in when he was a child. Acting also plays a key role in Szabó’s films, as he values psychological complexity in his central characters. In his first several features, he tended to use the same lead actors over and over—first András Bálint, then Klaus Maria Brandauer. Consistent with this focus on acting, he frequently employs long close-up shots to emphasize the play of emotions on the faces of his characters. In addition to writing and directing films, Szabó has also served in a variety of other capacities in the film industry, including writing and directing television movies and episodes, short films, and documentaries, as well as serving as assistant director, screenwriter, producer, and actor in films directed by others. In 1969, he was a member of the jury at the 6th Moscow International Film Festival. Szabó has directed several operas, including Tannhäuser in Paris, Boris Godunov in Leipzig, Il Trovatore in Vienna, and Three Sisters in Budapest. He has taught at film schools in Budapest, London, Berlin, and Vienna. In 1989, he was one of the founding members of the European Film Academy, and, in 1992, of the Széchenyi Academy of Literature and Arts. ↑ "Istvan Szabo Biography," <http://www.filmreference.com/film/58/Istvan-Szabo.html>, Film Reference. Retrieved 6 May 2012. 1 2 David Paul, “An Excerpt from ‘István Szabó,’” David W. Paul, 6 May 2012 <http://home.comcast.net/~dwp1944/Szabo.htm>. 1 2 3 Susan Rubin Suleiman, “On Exile, Jewish Identity, and Filmmaking in Hungary: A Conversation with István Szabó,” KinoKultura, 24 Jan. 2008, <http://www.kinokultura.com/specials/7/ssi-szabo.shtml>. Retrieved 6 May 2012. 1 2 Istvan Deak, “Scandal in Budapest,” The New York Review of Books 53.16, 19 October 2006, <http://www.nybooks.com/articles/archives/2006/oct/19/scandal-in-budapest/>. Retrieved 6 May 2012. 1 2 3 4 András Gervai, “A Screen Moralist,” The Hungarian Quarterly 43, Winter 2002. ↑ Kristin Thompson and David Bordwell, Film History: An Introduction (New York: McGraw-Hill, 2003), 460-469. ↑ David Paul, “Istvan Szabo,” Five Filmmakers, ed. Daniel J. Goulding (Bloomington: Indiana University Press, 1994) 162-164. 1 2 3 “Awards for István Szabó,” Internet Movie Database, <http://www.imdb.com/name/nm0843640/awards>. Retrieved 6 May 2012. ↑ Paul, “Istvan Szabo” 164-166. ↑ "5th Moscow International Film Festival (1967)". MIFF. Retrieved 2012-12-15. ↑ Thompson and Bordwell 624. ↑ “A Brüsszeli 12,” Sulinet, <http://www.sulinet.hu/tovabbtan/felveteli/2001/23het/kommunikacio/komm23.html>. Retrieved 6 May 2012. ↑ Paul, “Istvan Szabo” 175. ↑ Paul, “Istvan Szabo” 177–179. ↑ Joshua Hirsch, Afterimage: Film, Trauma, and the Holocaust (Philadelphia: Temple University Press, 2004) 116–117. ↑ Paul, “Istvan Szabo” 180–183. ↑ Paul, “Istvan Szabo” 183-187. ↑ Paul, “Istvan Szabo” 189-194. ↑ Paul, “István Szabó” 194-197. ↑ “Sweet Emma, Dear Böbe,” Karlovy Vary International Film Festival <http://www.kviff.com/en/films/film-archive-detail/20092680-sweet-emma-dear-bobe/>. Retrieved 6 May 2012. ↑ Istvan Deak, “Strangers at Home,” The New York Review of Books 47.12, 20 July 2000, <http://www.nybooks.com/articles/archives/2000/jul/20/strangers-at-home/>. Retrieved 6 May 2012. ↑ “Awards for Sunsine,” Internet Movie Database <http://www.imdb.com/title/tt0145503/awards>. Retrieved 6 May 2012. ↑ “Sunshine,” Rotten Tomatoes, <http://www.rottentomatoes.com/m/1097859-sunshine/>. Retrieved 6 May 2012. ↑ Roger Ebert, “Sunshine,” Rogerebert.com, 23 June 2000, <http://rogerebert.suntimes.com/apps/pbcs.dll/article?AID=/20000623/REVIEWS/6230305/1023>. Retrieved 6 May 2012. ↑ A. O. Scott, “Sunshine,” The New York Times, 9 June 2000, <http://movies.nytimes.com/movie/review?res=9803E3DB103FF93AA35755C0A9669C8B63>. Retrieved 30 September 2012. ↑ “Awards for Being Julia,” Internet Movie Database, <http://www.imdb.com/title/tt0340012/awards>. Retrieved 6 May 2012. ↑ "27th Moscow International Film Festival (2005)". MIFF. Retrieved 2013-04-13. ↑ Eddie Cockrell, “Relatives,” Variety, 5 Feb. 2006, <http://www.variety.com/review/VE1117929481/>. Retrieved 6 May 2012. ↑ Deborah Young, “The Door: Berlin Film Review,” The Hollywood Reporter, 10 Feb. 2012, <http://www.hollywoodreporter.com/review/door-berlin-film-review-289239>. Retrieved 6 May 2012. ↑ "Georgian fest kicks off with Istvan Szabo's The Door". ↑ “A Vizsga nyerte a Los Angeles-i Magyar Filmfesztivált,” Filmhu, 26 Nov. 2012, <http://magyar.film.hu/filmhu/hir/a-vizsga-nyerte-a-los-angeles-i-magyar-filmfesztivalt-hir-vizsga-az-ajto.html>. Retrieved 1 Dec. 2012. ↑ Necati Sönmez, “Ordinary Compromises,” Kinoeye 3.2, 3 Feb. 2003, <http://www.kinoeye.org/03/02/sonmez02.php>. Retrieved 6 May 2012. 1 2 István Szabó, “Essential Close-Ups,” Being Julia Press Kit, <http://www.sonyclassics.com/beingjulia/presskit.pdf>. Retrieved 6 May 2012. ↑ Paul, “Istvan Szabo” 159. ↑ Karen Jaehne, “Istvan Szabo: Dreams of Memories,” Film Quarterly 32.1 (1978): 38. ↑ “Portrait: István Szabó—Who Believes that Actors are the Most Important,” Danubius Magazin, <http://www.danubiusmagazin.hu/magazin/tortenelem/szabo_e.htm>. Retrieved 6 May 2012. ↑ “István Szabó,” Internet Movie Database <http://www.imdb.com/name/nm0843640/>. Retrieved 6 May 2012. ↑ “History,” European Film Academy, <http://www.europeanfilmacademy.org/History.42.0.html>. Retrieved 6 May 2012. ↑ “Széchenyi Academy of Letters and Arts,” Hungarian Academy of Sciences, <http://mta.hu/articles/szechenyi-academy-of-letters-and-arts-102941>. Retrieved 6 May 2012.